Roasted Chicken has become one of my cooking staples. 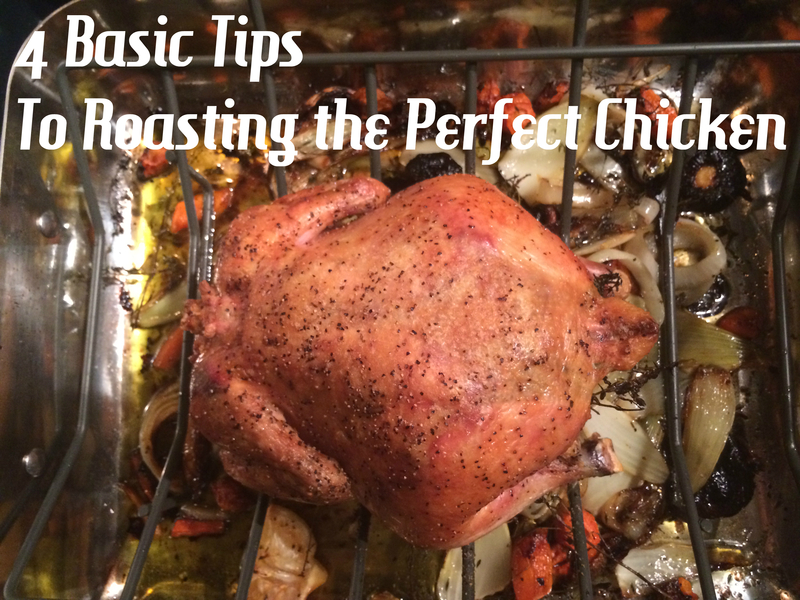 One of the reasons I didn’t try it sooner was because I often found roasted chicken to be dry and lacking flavor. But last Christmas, I decided to put my new roasting pan to use and perused the internet in search of the perfect chicken recipe. Well I’ve found it and want to share it with you. It’s AMAZING! The chicken is soooo juicy and flavorful, but I think the real reason I love this dish is because of the caramelized vegetables in the bottom of the pan. I could eat a plate of them alone! 1. Play with your veggies. Not only do you have an automatic side dish, but the juice from the chicken runs right into your vegetables resulting in outstanding flavors. Plus, your house will smell incredible! 2. Season generously. Go heavy on the salt and pepper- freshly cracked works best. This brings out the natural flavor of the bird. Also, don’t be afraid to play with other spices and herbs. 3. Add fat. Butter that bird up! You want that baby to look like it spent way too much time on an exotic beach when you’re done.Plus you want that skin nice and crispy. Olive oil also works here too. 4. Layer the flavor. Don’t forget to stuff the cavity with lemon halves, onion, garlic and a big bunch of thyme. The flavors will reach every piece of meat and have your family asking for more! 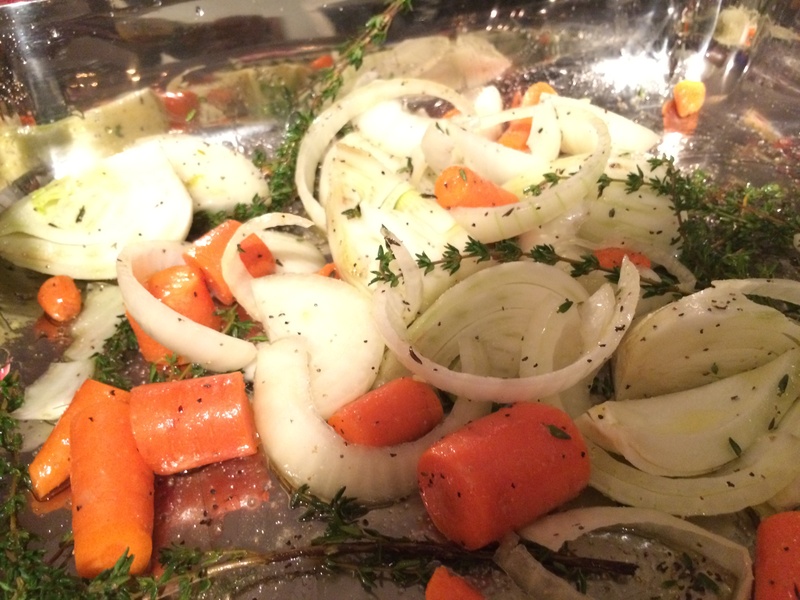 Place the onions, carrots, and fennel in a roasting pan. Toss with salt, pepper, 20 sprigs of thyme, and olive oil. 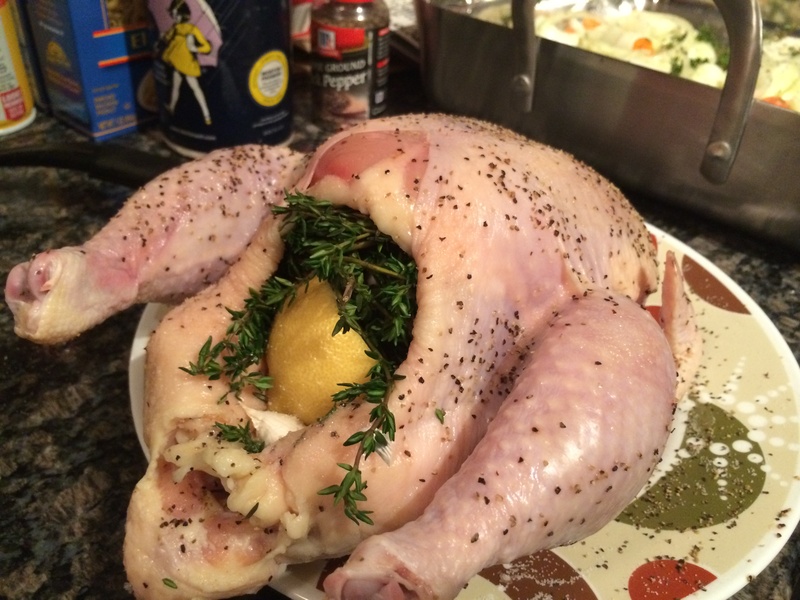 Spread around the bottom of the roasting pan and place the chicken on top. *Tanisha’s Tip: Cook the chicken breast side down so that all the juices run down into the white meat which can tend to be dry.